Designed for mid- to high-end computer systems, servers and networking hardware that use conventional and Active Power Factor Correction power supplies. 10 battery-backup, surge-protected outlets and USB and Serial ports defend against harmful surges and spikes and keep your devices running during temporary power outages. 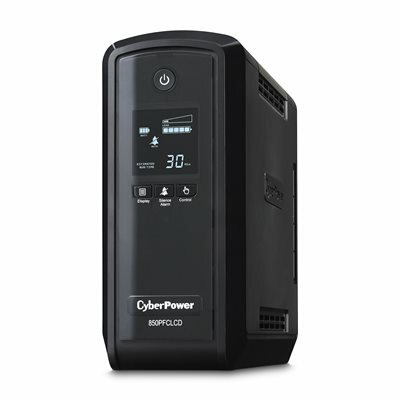 The CyberPower CP850PFCLCD PFC Series UPS Systems with pure sine wave safeguards computer systems that use conventional and Active Power Factor Correction (PFC) power supplies. Its automatic voltage regulation (AVR) topology delivers clean and consistent AC power. The patented GreenPower UPS advanced circuitry reduces UPS energy costs by up to 75% compared to competitive models.CyberPower's PFC Series UPS with pure sinewave output is the first to address the critical compatibility issues of non-Sinewave UPS products working with computing systems using Active PFC power supplies (ENERGY STAR 5.0 compliant). 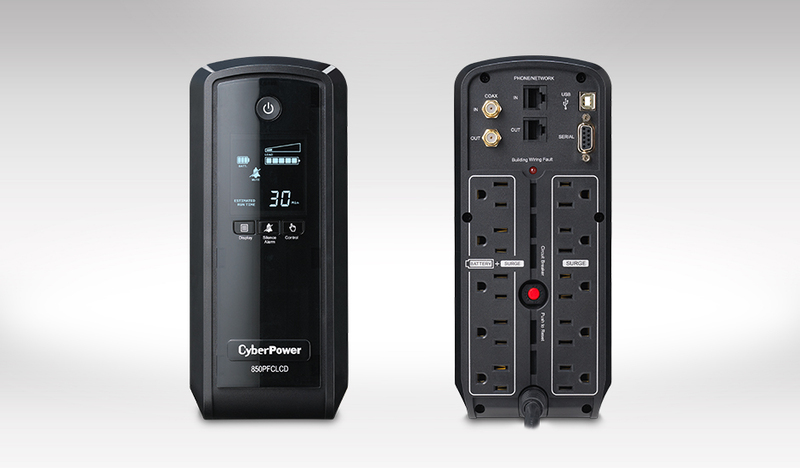 CyberPower's innovative PFC Series UPS is an affordable solution that ensures equipment utilizing Active PFC power supplies do not unexpectedly shutdown or experience harmful stress when switching from AC power to UPS battery power.The CP850PFCLCD unit has a capacity of 850VA/510Watts, (10) NEMA 5-15R receptacles and (1) maintenance-free, user-replaceable 12V/8.5Ah batteries. The intelligent multi-function LCD panel displays real-time UPS vitals for ease of control. Connectivity via (1) HID USB and (1) DB9 serial ports. Surge Protection for RJ11/RJ45 & coax. Resettable circuit breakers offer reliable overload protection for safety. EMI/RFI filtering helps ensure a clean signal. Multifunction LCD display showcases easy-to-read information. Sealed lead-acid battery recharges in approximately 8 hours for fast replenishment. Mini-tower form factor enables versatile placement options throughout your home. Includes PowerPanel Personal Edition software. This product comes with a with a $250,000 connected equipment guarantee. See user manual for details. Use PowerPanel® Personal Edition software to manage runtime, track power events and more.